The Automatic Transmission Fluid (ATF) temperature sensor converts the fluid temperature into a resistance value for use by the TCM. The TCM applies a voltage to the temperature sensor through terminal THO1 of the TCM. The sensor resistance changes with the transmission fluid temperature. As the temperature becomes higher, the sensor resistance decreases. One terminal of the sensor is grounded so that the sensor resistance decreases and the voltage goes down as the temperature becomes higher. The TCM calculates the fluid temperature based on the voltage signal. Condition (A): 5 minutes and 45 sec. or more have elapsed after the engine start when engine coolant temperature or intake air temperature is -29.375°C (-20.875°F) or less. 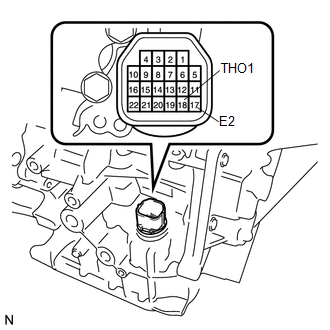 Condition (B): 10 seconds or more have elapsed after the engine start when engine coolant temperature and intake air temperature are more than -29.375°C (- 20.875°F). 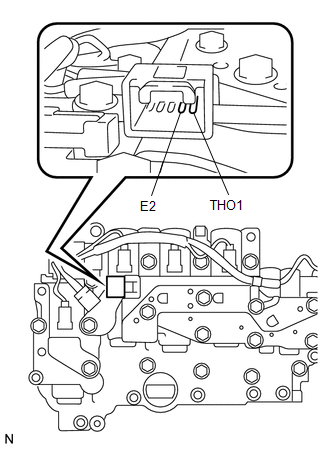 These DTCs indicate an open or short in the automatic transmission fluid (ATF) temperature sensor circuit. The automatic transmission fluid (ATF) temperature sensor converts ATF temperature into an electrical resistance value. Based on the resistance, the TCM determines the ATF temperature, and the TCM detects an open or short in the ATF temperature circuit. If the resistance value of the ATF temperature is less than 79 Ω*1 or more than 156 kΩ*2, the TCM interprets this as a fault in the ATF sensor or wiring. The TCM will turn on the MIL and store the DTC. *1: 150°C (302°F) or more is indicated regardless of the actual ATF temperature. *2: -40°C (-40°F) is indicated regardless of the actual ATF temperature. The ATF temperature can be checked on the Techstream display. The monitor will run whenever these DTCs are not present. When DTC P0712 is output and the Techstream indicates 150°C (302°F) or more, there is a short circuit. When DTC P0713 is output and the Techstream indicates -40°C (-40°F), there is an open circuit. Measure the resistance between terminal THO1 (OT) and body ground. 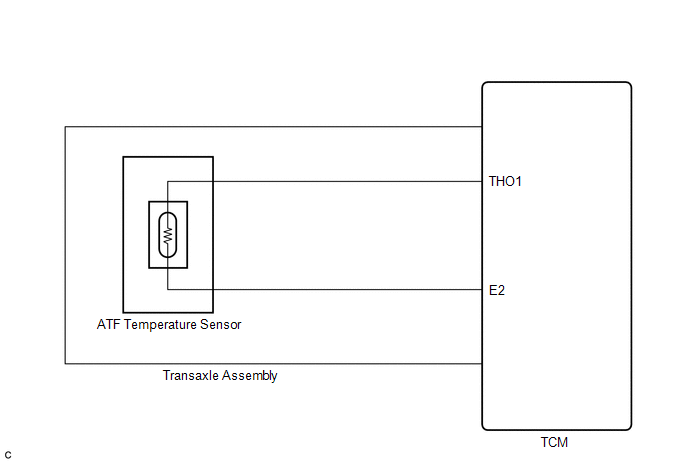 If the circuit related to the ATF temperature sensor becomes open, P0713 is immediately set (in 0.5 seconds). When P0713 is set, P0711 cannot be detected. It is not necessary to inspect the circuit when P0711 is set. 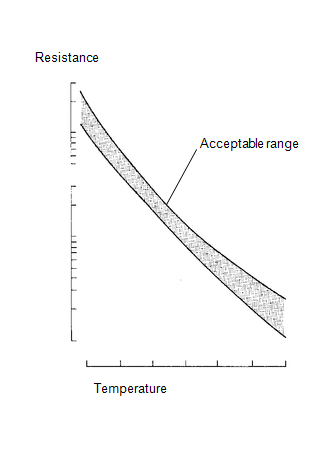 If the resistance is out of the specified range with the ATF temperature shown in the table below, the driveability of the vehicle may decrease. (a) Disconnect the ATF temperature sensor connector from the transmission wire.